BU very well represented in this year’s ERCS Festival! The ESRC website lists its Festival events for 2015 and amongst the interetsing events is a record number of BU events! The full list can be found on the ESRC webpages, click here! 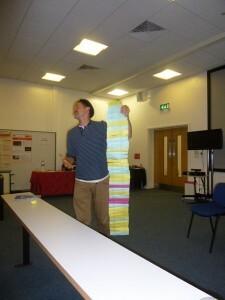 Pathways to impact: part deux! 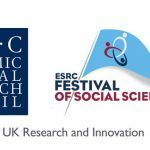 This event aims to engage participants who attended a previous one-day ESRC Festival of Science event which took place in 2012 entitled, “Pathways to Impact: ageing, diversity, connectivity and community”. 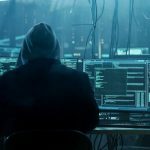 Older people are increasingly at risk of falling victim to financial scams that target vulnerable people, including mass marketing fraud via post, telephone or email and doorstep fraud. 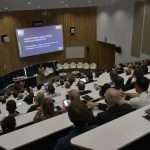 This event will give practitioners, agencies and members of the public, the opportunity to come together to learn more about the threats posed. what meanings of place and space are constructed by secular or non-specifically religious and religious visiting of church buildings? Bournemouth University Dementia Institute (BUDI) will bring dementia awareness to life through running creative activities including a performance from the BUDI Orchestra – made up of people affected by dementia and musicians – poetry and technology such as IPads and Nintendo Wii. 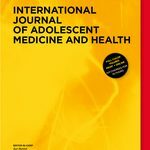 Child deaths and poverty: disadvantaged British children! Are British children disadvantaged compared to children in other Western countries? 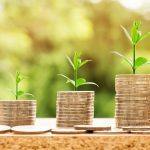 An analysis of data from global sources compares the standards of mortality, poverty and health funding for children and adults in Britain vs. those in 20 other Western countries. 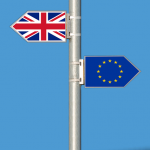 One year ago, in October 2014, the UK Government introduced major changes to the Copyright Law with the aim of promoting innovation and creativity. 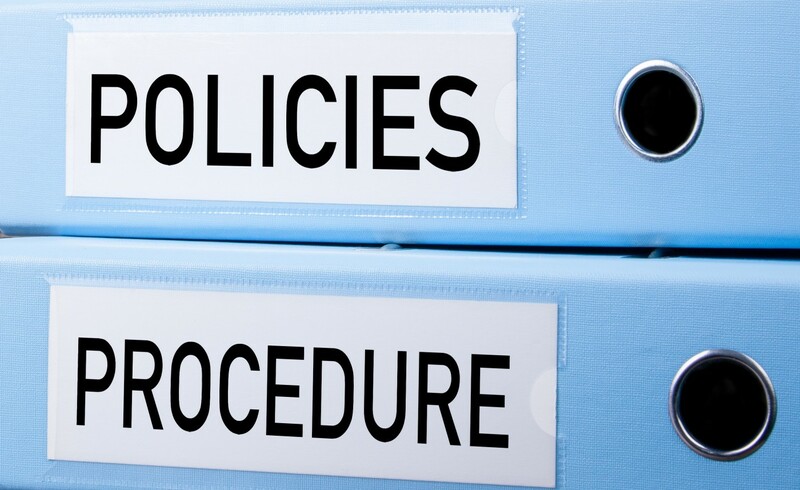 These included a range of exceptions and limitations benefiting users as well as educational and cultural institutions. These exhibitions run over the course of three days presenting a showcase of Bournemouth University research projects demonstrating our research impacts on social and community wellbeing and our concern for diverse groups and work with a wide variety of stakeholders. A group of researchers from Bournemouth University are researching the lived experience of students entering higher education from and in ‘non traditional’ contexts. By bringing together research, educational practice and students as research co-creators, a unique lens is created through which to observe the question. The 5-a-day campaign went global after a recommendation from the World Health Organisation that we should all be eating a least 400g of fruit and vegetables per day. Variations on this message are repeated in countries all across the world. But does the message cause more confusion than good? On 9 September, we held our fourth annual Carers’ Forum. Our Carers’ Forum provides an opportunity to hear from local people who are caring for people with dementia on what matters most to them. We were also delighted to welcome Vivien Zarucki, Independent Financial Advisor, as our guest speaker who discussed the financial aspects of caring for someone living with dementia. Alison Adams, Information Worker from the Alzheimer’s Society, was also on hand to provide attendees with details about local support for people affected by dementia. In a parallel session, people with dementia participated in a range of activities (including using technology such as IPads), and talked to the team about what it’s like living with dementia locally. “Thank you so much for the whole experience. Once again we are very blessed with the care and encouragement we receive”. “Many thanks to all that helped arrange the day, the person we care for enjoy meeting others who are in the same situation as themselves”. “It was good to exchange ideas. People always know something you don’t”. These views and experiences will enable us to focus our research, education and consultancy services around the issues that matter most to people who are affected by dementia. On Monday 13th July 2015, BUDI welcomed more than 50 members of the public at their annual Festival of Learning event. 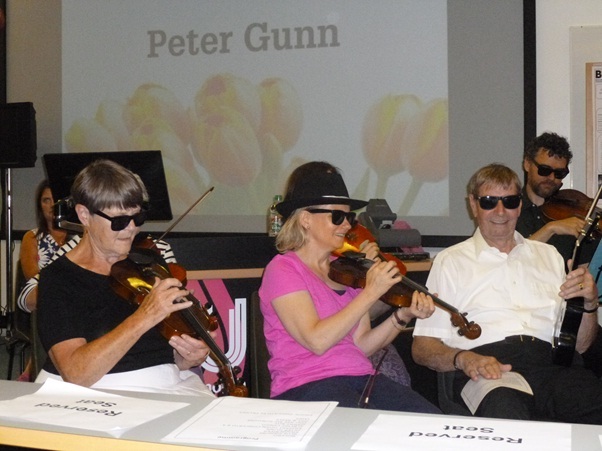 The event was opened by the BUDI Orchestra (formed of people affected by dementia and musicians) with an energetic and fun performance that included a rendition of the Peter Gunn theme by the Blues Brothers (complete with trademark sunglasses) and the Jaws theme tune. Attendees were able to participate in a number of hands on activities, from sharing their thoughts on what makes a garden dementia-friendly, to discussing what they are passionate about in the dementia field with members of the BUDI team in speaker’s corner. a term that restricts their freedom. long live music and song! Dementia is not the end. Second at the Royal College of Nursing annual congress held locally this year at the BIC where we presented the project to a surprisingly full and room (as our session was 5-6pm after a long day for delegates) and met with great enthusiasm. 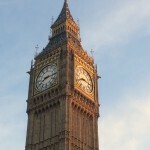 Lastly, following a well received presentation featuring the BUDI orchestra work back in May at a UK collaborative meeting between Universities engaging in social research on dementia we were lucky enough to be invited to a roundtable discussion held at Westminster on Thursday 25 June. This discussion was attended by practitioners, academics, government agencies (e.g. NHS England, Public Health England) and care providers, where we had the opportunity to share our work with colleagues and also to learn more about other music projects; the majority of which largely fall under the umbrella of music therapy, but also a range of other creative initiatives designed to engage and improve the well-being of those living with dementia. The BUDI orchestra remains a unique initiative in that our approach is inclusive (students, musicians, people with dementia at all points in their journey through dementia, and family members working together to learn, rehearse, play and then perform) and designed to provide a social and fun experience for people with dementia living in the community. (By contrast much music therapy is only available in clinical and care settings). If you haven’t seen the BUDI orchestra in action yet we have two performances coming up in the next couple of weeks – 11th and 13th July. Do come along and support our nationally and internationally innovative and unique work! Raising awareness of dementia has been a key part of the last three years of BUDIs work. This week we held our 4th annual public open meeting to coincide with national Dementia Awareness Week. The highlight for me was our carer and person with dementia panel where participants from some of our projects spoke about their experiences of living with dementia in the community and the impact our initiatives have had on their lives, in particular the BUDI orchestra. 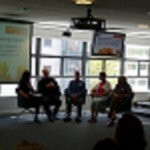 I concur with the comment of one attendee that “The carers panel was thought provoking”. The ultimate aim of the work we do is about improving lives and it is only by hearing about people’s direct experiences that we can ensure that our ongoing and future work addresses the needs and aspirations of those impacted by dementia. Another attendee commented “Much wider range of speakers than expected” reflecting the range of projects we showcased, both BUDI projects including, evaluations of dementia-friendly community initiatives in Dorset and North Somerset; our intergenerational IT Club; BUDI Orchestra; Gardening; and Care Farming. 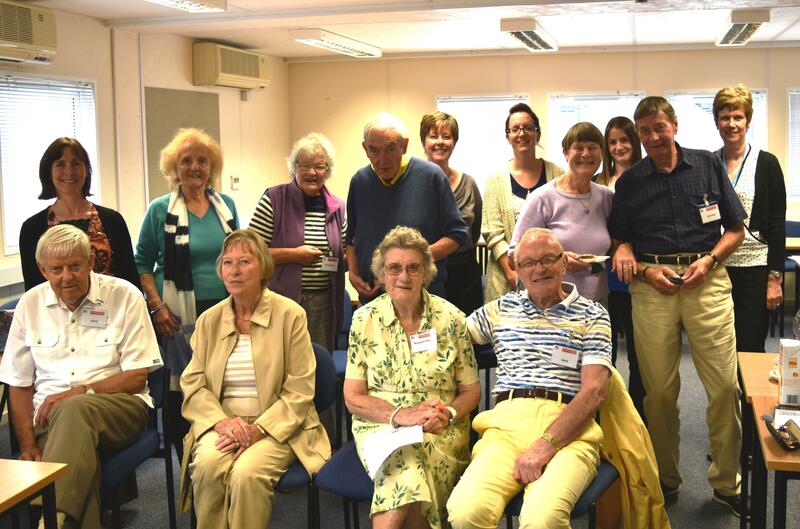 As well as a number of external organisations we work with who shared the work they are doing locally to support people with dementia living within the community, including: Alzheimer’s Society, Future Roots, Dorset Fire and Rescue Service, and the Wessex Academic Health Science Network. Dementia Friends sessions are part of a national initiative by the Alzheimer’s Society to raise awareness of dementia within our local communities. The sessions are designed to help people learn more about what it’s like to live with dementia so that those affected by the condition can feel included in their local community. Dr Michelle Heward and Dr Ahmed Romouzy Ali from Bournemouth University Dementia Institute (BUDI) will be delivering a Dementia Friends session on Thursday 21st May 2015 10-11 am in TAG22, Talbot Campus at Bournemouth University. 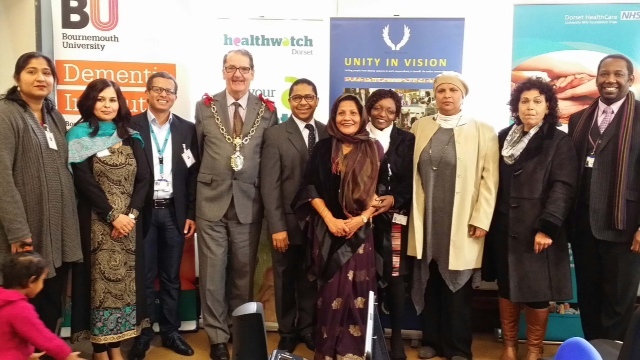 On 5th December, I went to Dorchester to attend the launch of a new project- “Visions in Advocacy for BME Carers”. It is an advocacy service for Black and Minority Ethnic (BME) Carers across West Dorset, Weymouth and Portland areas. This is a Unity in Vision project– which is a member of the Bournemouth Council for Voluntary Service. Their focus is to bring diverse communities together to share a common goal and celebrate their own diversity. This project is funded by the NHS Dorset Clinical Commissioning Group (CCG) and Dorset Council to run an advocacy service for a year. The launch event was attended by delegates from local BME communities, and the Mayor of Dorchester, Councillor Peter Man. I wore three hats at this event. One as a team member of Bournemouth University Dementia Institute (BUDI); one as the Visions in Advocacy for BME Carers- Project Coordinator and one as the Chair of the BME Community Engagement Panel in Dorset. In my speech I explained the work of BUDI, the goal of the project (which is to ensure that all carers are supported by a system which understands their needs, promotes their wellbeing and assists them in their caring role) and in addition informed the audience about the BME Community Engagement Panel. I welcomed and encouraged all to take part in the panel meetings to help them integrate better. 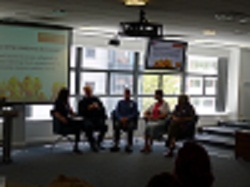 It should be noted that the BME Panel is currently supported by the Access and Equalities Development Team at Dorset HealthCare University Foundation Trust (DHUFT) and Bournemouth University Carer & Service User Partnership. The Mayor said to me upon his departure- “Thank you for everything you are doing”. I would like to extend his thanks to all staff in BUDI; all the project volunteers; and all the BME Panel members. At the beginning of 2014 BUDI was lucky enough to secure FIF CCCP funding to set up the BUDI orchestra, a partnership project with the Bournemouth Symphony Orchestra supported by BU Music Scholars and other students. I blogged about this during the rehearsal period and after the performance at the Festival of Learning, but as the project officially comes to an end as we write our final report I am blogging a final time to give a little update. First we won a poster prize two weeks ago at the 7th International Rural Dementia Summit running concurrently with the 7th Safety and Health in Agriculture and Rural Health Populations conference in Saskatchewan, Canada and Canadian colleagues are now interested in setting up their version of the BUDI orchestra in two provinces. We also secured some further funds to extend the project and are currently rehearsing for an informal Christmas performance that will take place in the Atrium/Starbucks on 12 December, do stop and listen as you enjoy your coffee! If any member of staff/student would like to join us as we rehearse, particularly anyone with a strong singing voice do get in touch with Laura (lreynolds@bournemouth.ac.uk)who can give you more information about our rehearsal schedule, as we are missing our BU Music Scholars this time round who led the singing part of the rehearsals so well in the initial project. We also secured funding from the Dorset Legacy Fund to begin a new orchestra project and this will commence in January 2015. We have submitted a larger grant application to conduct a multi-site study but we have a few months to go before we will hear if we are successful or not. 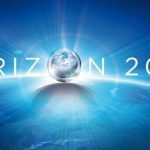 We have received extremely positive feedback from our participants, students and BSO colleagues who have been part of the initial and ongoing project extension and the idea has been favourably met at regional and international conferences where we have shown the video we created documenting the project. The BU FIF provides an excellent opportunity to conduct pilot/proof of concept work and we are grateful for the funds received enabling us to undertake this work which has been the most fun project I’ve been involved with to date.